The Stack Exchange developers instituted a Be Nice policy for all of their sites. I think it would be a good idea to remind people of this when they make snarky comments. We could either reply to their comment with a link to the Be Nice policy, or a link to this thread. I think a lot of people on this forum want to be witty, but are unaware that sometimes their wit comes across as belittling. People should be mindful that kindness comes before wit. I'm creating this thread so that others can share their thoughts, and perhaps commit to calling others out on hostile or demeaning comments. Questions not worth asking. I sometimes get the impression that my question is not worth asking, and have to spend time defending myself. Answers picked apart. I feel like, if people sense any weakness in an answer, it gets picked apart in a way that's not constructive. Speaking from authority. Sometimes people claim that your question or answer does not follow the guidelines. But they cite no guidelines to back themselves up. Carelessness with tone. The fact that tone is hard to discern from writing does not provide an excuse, but rather an obligation to make one's intentions clear and one's kindness felt. Positive feedback. Since we're kind of skewed towards negative feedback, I think it would be helpful if users made an effort to give more positive feedback, especially to newbies. Pointing out the guidelines. It would be helpful to point out the guidelines to newbies, without shaming them for not having read them already. Migrating ELL questions to ELL. Members who have the privileges could make an effort to migrate ELL questions to ELL. Close-vote nicely. It's important to close-vote off-topic questions. But it's just as important to be nice and not make a snarky comment. Let me say this in as a nice a way as possible: It is clear from the guidelines that this is not a place for people learning the English language to ask questions, especially if they are basic questions and/or they evince no research. Yet, my question to you is why do you keep answering such questions... one of many examples. This question should be close-voted for no research. It is actions like yours that only encourages more ELL questions here. This comment was directed at me in this thread. The tone of the question made me feel vilified. I actually double-checked that draconic was okay to use, and it's a synonym for draconian. (1) merriam-webster.com/dictionary/draconic. (2) en.wiktionary.org/wiki/draconic. I chose to use it because it sounded better in the sentence. I actually double-checked. Then you actually missed my point. The above was also taken from this thread. The play on actually felt a little bit like an attack. Beneath is a question that I asked. Example: He came up with a catalogue of things his father said or did which upset him. Is the use of "catalogue" correct in this example? I personally think so, as the word derives from the Greek καταλέγω, which means to "recount, to tell at length, or make a list" (1). Yes, it is normal; but your argument from Greek is irrelevant. Actually, what I gave wasn't an argument, it was a reason for thinking so. Why not share things we find interesting? An argument makes a claim. It attempts to persuade. I did neither. I simply shared my hypothesis. And I am pointing out (by the link I referenced) that your hypothesis is without foundation. If you rely on etymology to determine (as opposed to suggest) the meanings of words, you will often get them wrong. I was offended in the above thread because the commenter is acting like a know-it-all; and, furthermore, acting like he knows my intentions better than I do. To say that you think something is correct because of etymology doesn't mean you know something is correct because of etymology. A hypothesis is not the same thing as an argument, and it's perfectly fine to share a hypothesis. Below is a question I asked and the ensuing comments. Question: Since English is a stress-timed language, why have poets chosen to write in iambic pentameter? Doesn't the language already have a natural rhythm without resorting to meter? And isn't that natural rhythm already quite close to iambic pentameter? Commenter: This question doesn't really make sense. Poets chose to write in Iambic pentameter because they wanted to. Why did they want to? Well, you need to ask a historian but I imagine the traditions derived from Latin and Greek were factors. Languages with word stress patterns do, of course, have their own rhythm, but it's inevitably irregular and in the mind of classically influenced poet an irregular and naturally occurring meter is probably insufficient. That's why they tend to work English's natural stress pattern into a precise meter, such as iambic. Me: I think I'm asking whether the natural rhythm of English is really so different from iambic pentameter that a precise meter is called for. It seems that the definition of a stress-timed language is regular stress patterns, which already accomplishes what meter sets out to do. Although here's an interesting thought: perhaps meter serves not only to highlight regularities, but also to highlight irregularities? That is, accenting syllables which we wouldn't expect to accent. Commenter: No offence, but this question seems to be more about your dismissive attitude towards Iambic pentameter than an actual question. Many English speaking poets evidently did feel there was something special about, which is why they worked so hard to fit the natural rhythm of English into it's meter. Many modern poets don't use it, well obviously, many modern poets don't even care about meter. "what, if anything, is the natural rhythm of spoken English?" This question doesn't really make sense, English doesn't have a strict meter, there are just natural linguistic patterns in stress. Me: You misinterpreted my comments, then! I do not feel a dismissive attitude towards iambic pentameter. On the contrary, I enjoy a lot of poems and plays written in this meter. This enjoyment is what led me to reflect on the meter, and why some of the authors whom I admire choose to employ it. Commenter: But the question you're asking isn't really about English. You're basically asking why many English speaking poets chose to fit English's natural time stressed rhythm to Iambic pentameter. The only answer is because they wanted to, why they wanted to might be better explained by a historian. The natural rhythm of a time stressed language will never as regular as a poetic meter, so no doubt they thought it more beautiful or perfect when the meter was exact. Why they often preferred Iambic is probably down to its historical significance. There's little else to be said. The above is another example of a commenter acting like a know-it-all. It's not constructive to say, I don't think your question makes sense. Or to go on and say, There is little else to be said. That's simply not for him to decide. Others might have something to say; and in fact, others did have something to say. There was a great answer to my question. The reason we have close-votes is so that we vote on whether a question gets closed. This is not a court case where we need a prosecutor. Be nice is one part of the Stack Exchange model. Civility is strongly encouraged. If more users paid heed to such simple guidance more closely, I believe ELU would quickly become a much “nicer” place. Personally, I think it’s easier to find so-called belittling comments on questions that are scant in details and show no research than to find such comments on questions that are well-researched and richly detailed. Insofar as manners go, ignoring site guidelines from the get-go could be considered a form of rudeness, too. Both of these steps are important. Step 1 will get moderators involved to protect the site and the community. Step 2 will help de-escalate the immediate situation. For example, if someone posts a demeaning comment, it helps if you do not reply (disengage), and instead flag the comment. We'd like to help you out, just as soon as we can figure how you got in. The reason is structural, built in, if you will. The site is a soi-disant place "for linguists, etymologists, and serious English language enthusiasts." And there is a group of people who take that seriously and proprietarily. They treat this place as High Table in the Hall (or perhaps the Fellows' Common Room), and they want to see deep questions, expect meticulous research and scholarly citation for both questions and answers, and wish to curate an archive of definitive answers. Unfortunately, these folks are locked in a deadly embrace of mutual incomprehension with people who don't (and I maintain, can't) meet these standards. Frustration is inevitable, and this sometimes leads to a certain amount of — shall we say — brusqueness? My advice is to forgo your own cyber-umbrage, even if in principle it's warranted. After all, you know nobody here. How important in your life can our attitudes be? And imagine the result of commenting on every piece of snark with a link admonishing "Be Nice". You can't control other people's behavior, you can only control your own. Because of this, I don’t think it’s a simple matter to make the community nicer. So rather than trying to do that, I am just going to focus on what I’ve been doing already: answering questions, commenting on questions and answers, voting posts up and down, posting links to related posts, voting to close, reopen, delete, and undelete questions. You suggest calling out any comments I see that I find unkind. I am not convinced that I should try to do this. Call-outs take effort, especially since it’s easy for a call-out itself to cause offense. If I commited to this course of action, I’d have to spend a fair amount of time thinking about how to word these messages. And even if I made this effort, I might get it wrong and end up offending people in the attempt to make the site nicer. I don't think that would be helpful. The other issues and suggestions are about topics that I already have thought about, and I would guess many other members of the site have thought about as well. Questions not worth asking. I agree that it’s not enjoyable when people act as if a question is not worth asking. I also think that some questions are actually bad. And sometimes, "bad" questions are salvageable with editing. When this is the case, a comment pointing out weaknesses of the question may actually be useful. It's easy for such a comment to just be rude, of course, but I don't think there is an easy way to determine how to classify comments on questions. Answers picked apart. As The Nate says, critical comments are often constructive and they can be very useful. Personally, I would strongly resist any attempts to discourage leaving critical comments, because I want to learn about any weaknesses in the answers that I write or the answers that I read. Of course, commenting should not take the place of downvoting and posting an alternative answer, but I don't really understand how it would help anyone if people were silent about the weaknesses of answers. Speaking from authority. I agree, it's more useful to cite relevant guidelines. That's what I try to do when I leave a comment about site guidelines. But it's not totally useless to post a comment without a link. It at least notifies the owner of the post about the general kind of rule that might be relevant. Carelessness with tone. I don't know how to respond to this point. I try to watch my tone in comments and posts. I have no control over the tone of other people's comments, and as I mentioned above, I am not convinced it would make things better if I committed to calling out any comments that seem to me to have an unkind tone. Positive feedback. Are we skewed towards negative feedback? I actually don't know. Regardless, the main methods of positive feedback I know of are upvotes and comments. I already use upvotes on content that I find helpful. I might comment if there is something in particular that I think it would be useful to point out, but this takes more effort and I feel like it may just add noise. Newbies may need more positive feedback, but it's frequently exhausting to actually take effort to do this, since there are many new users and a large proportion of them don't stay even if they get positive feedback. Pointing out the guidelines. Members already do this. I have a document filled with pre-written comments with explanations and links to the guidelines; I mentioned some of them in this answer. I know some other site members have a similar methodology. Sometimes it helps, often these comments are just ignored. Migrating ELL questions to ELL. This already happens, a lot. (In fact, I'm inclined to think it happens more often than it should. There are issues with migrating low-quality questions that have been mentioned for example by Catija in the comments here.) 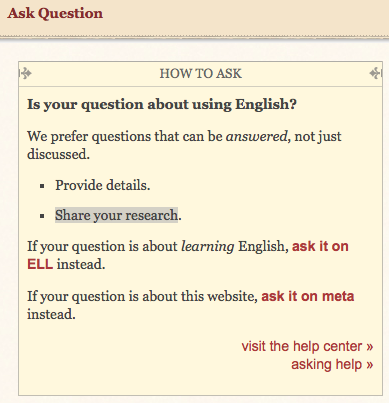 People on this site are very aware of the existence of ELL, and often try to send learners there. Close-vote nicely. I agree that it's best not to leave a snarky comment when close-voting. I try to avoid doing this, or upvoting comments like this. I don't know of any way to prevent any member of the community from doing this, however. I see two problems with adopting a policy of systematically and publicly calling out commenters for remarks that one or more other site participants interpret as "not nice." First, I think that such challenges are difficult to lodge politely. How do you call out a site participant for failing to be kind without implying that the person is in fact unkind? And how is posting that charge not a species of public shaming? Perhaps the person making the charge considers the criticized commenter guilty of serious rudeness and so feels uninclined to shed a tear on behalf of the transgressor's bruised feelings. But I think public shaming is inherently problematic, whether the person doing the shaming is a blackhearted troll or a squeaky-clean, newly minted member of the anti-brute squad. Second, I don't think that calling out misbehavior to the community at large (as opposed to flagging it for consideration and action by the site's moderators) is a healthy thing for the site. To the contrary, I think it gives inordinate power to site members who have their antennae out for opportunities to be aggrieved on their own or someone else's account, who tend to think the worst of others' motives, and who are quick to demand vindication of their (or others') rights against the wrongs they believe they (or others) have suffered. Hypervigilance against the endless danger of microagression inevitably leads to endless discoveries of the crime. To me, the notion of English Language & Usage as a safe place where no one ever says anything that upsets anyone else, and where that safety is enforced by an eternally watchful citizenry continually vetting everything everyone else says, is far from ideal. I would prefer that participants begin by imagining that we're all on the same side, collaborating to produce useful, interesting questions and answers. And when a comment falls glaringly short of that ideal, and it isn't possible to write it off as an error of phrasing or construction, or as a temporary and uncharacteristic departure from good behavior, I would rather that the site moderators take up the case with the transgressor in private. I don't think that the intellectual equivalent of walking on eggshells all the time is good for the soul, and I don't see how a community becomes friendlier, more welcoming, and more collaborative by giving the most aggressively sensitive person in the room unilateral authority to determine for the community what constitutes a hurtful or otherwise unacceptable comment. That's not to say that EL&U is a paragon of friendliness, welcome, and encouragement. Some participants at this site have a tendency to tell newcomers, in effect, "you can't play here until you prove you're good enough." It's a recipe for bad feelings, and sometimes there is a bullying aspect to it. But a policy of public shaming for rudeness, I think, would only drive the existing hostility toward newcomers farther underground, leading to an increase in anonymous and unexplained negative conduct: no-comment close voting, no-comment downvoting (which is already very common on the site, maybe in part because downvoters sometimes get burned by angry downvotees when they tried to explain their downvotes), and no responses to provocative questions on Meta. In my view, the best way to improve the treatment of others at this site is to try to live up to the behavior you consider appropriate yourself. That seems to have been the upshot of the question and answers given at Bring back the Summer of Love (aka Make new users feel more welcome), a Meta post that drew a tremendously positive response (47 upvotes, 3 downvotes at last count) and some outstanding responses. The discussion there may even have contributed to better behavior by site users, by encouraging site participants to be more thoughtful and less dismissive of newcomers. The current net positive vote of +11 (20 upvotes, 9 downvotes) on the present question may be taken as evidence that EL&U participants are ready to start calling out rudeness whenever they encounter it; but I suspect that at least some of the upvoters are simply agreeing with the proposition that the site could be nicer than it is and that established site users should make an effort to treat visitors better than they sometimes do. The best thing about the poster's question here is that it honestly expresses the poster's view of what constitutes unacceptably unkind behavior, offers a possible solution to the problem, and then invites others to weigh in with their views on the same subject. That's the sort of debate we ought to be able to engage in—politely but without suppressing our own opinions for fear of upsetting someone—on a site that by and large respects intelligent discussion. Does this question belong on English or Writers?